To supplement this web site we have established two Blogs, one concerned with occasional news and another covering our work on 3D imaging in the context of archaeological research in addition to providing public access to our 3D modelling projects thanks to support from Sketchfab. Because of the priority given to the writing up programme for the West Heslerton Excavations the LRC website is currently infrequently updated. This is because behind the website sit the interactive archives that support the LRC Digital Atlas (this resource uses the Google Earth Plugin and at present works best with the Firefox browser) and the West Heslerton Anglian Settlement Archive for Google Earth. These are vast and complex data sets that have been structured for interactive access. In time this website is to be replaced and the interactive archives placed in the D-Space Archive at the University of Cambridge; we are working with the University to make sure that the full interactivity of the data can be permanently supported as an interactive component of our ongoing publication programme. The structure and creation of the interactive archives result from more than 30 years of research and, since the resource works in this website context, we are not updating this website at present. LRC director Prof Dominic Powlesland was recently invited to speak in Boston USA where he delivered lectures at Harvard, Boston College and at Google. 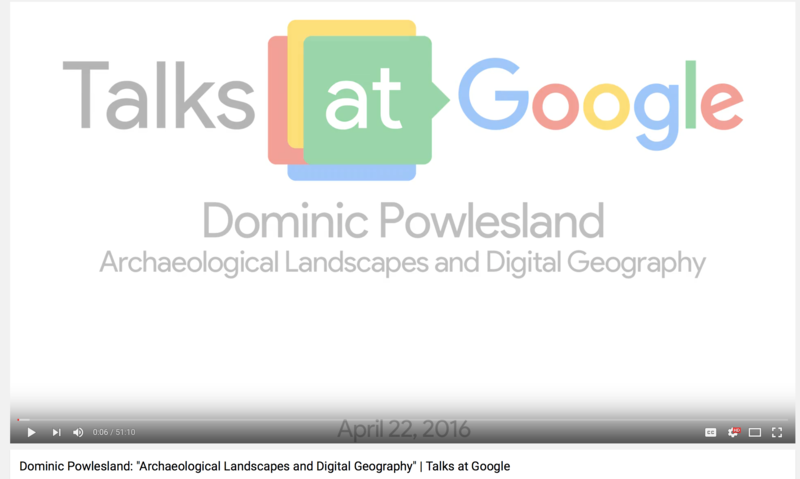 The Google Talk is now online and can be viewed by following the link from the image below. An ancient Chinese Oracle Bone modelled as part of a joint project with the Cambridge University Library has now been viewed by more than 9,000 individuals. The project has been reported in the online journal Phys.Org The digital 3D model was then used to cerate a 3D print which can now be seen in the University Library. The value of online 3D models like that of the Oracle Bone is highly significant and is accessible to anyone with a computer or a smartphone. A collaborative project between the LRC, The British Museum and the Universities of Leicester and Nottingham supported by the Leverhulme Trust led us to create a 3Di model of an Early Anglo-Saxon cremation Urn, excavated from a cemetery at Loveden Hill in Leicestershire in 1963. The pot is unique in that it has a runic inscription running round the body of the vessel. This 3D model makes it [possible for anyone around the world to view this model which otherwise owing to the realities of limited display space is held in storage at the Britsh Museum. The nature of the object is such that even if it were on display it would be very difficult for people to view all sides and see the inscription in its entirety.